I call it a "back buzz." It's that tiny sympathetic buzzing sound that comes from the peghead end of the guitar when certain notes are fretted. The cause is subtle but quite simple. 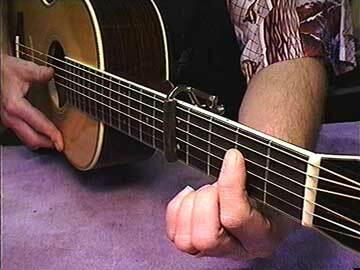 The string sits a bit low at the nut and just barely touches the frets behind the position where it's held down. When the note is struck, the portion of the string between the fretted position and the nut sets up quite a nasty little noise. Just touching the offending string will immediately cause it to shut up. It's also possible for the same conditions to occur because there is not enough relief in the fingerboard. Checking the neck relief is a first step in buzz diagnosis. Once the truss rod is adjusted, then the nut is where the adjustment will be made to eliminate the sympathetic back buzz. Raising the nut a little will eliminate the back buzz. Click here to see how I go about this simple repair.